Vehicles with a C6 transmission often have poor line rise, which results in erratic shift timing, reverse shudder or direct clutch failure. This can be caused by the reciprocating boost valve wearing the inside diameter of the boost sleeve. When this occurs, oil that enters the modulated line pressure orifice leaks past the boost valve and exhausts through the reverse orifice, resulting in poor or no line rise. 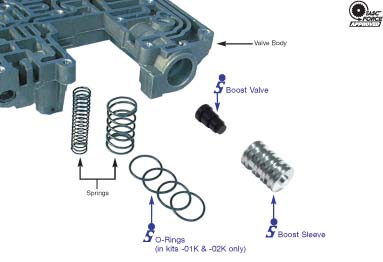 The outside diameter of the boost sleeve may allow some leakage through the valve body, which can result in insufficient line rise.The Sonnax replacement reverse boost valve & sleeve kits eliminate the above problems. 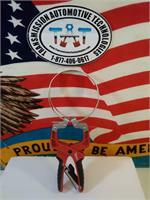 Sleeves are manufactured from highly wear-resistant aluminum alloy. Boost valves are made from hard-coat anodized aluminum to prevent excessive wear on the inside diameter of the boost sleeve. Replacement assemblies 36946-01K, 36946-02K and 36941-01K include o-rings to provide additional protection against both cross leakage and oil exhausting through the valve body bore. The 36946-01K, 36946-04K and 36941-01K kits provide normal line pressure boost (gas ratio). The 36946-02K and 36946-03K kits provide increased line pressure boost (diesel ratio) and are recommended for all heavy duty applications. The 36941-01K kit works early model "clicker" versions with screw on boost valve end plate.